Nearly everyone has a horror story of some mishap involving their entries. Some could be educational: the sun burned the unprotected orange cups in the backseat on the way to the show, etc,. Others could be entertaining and unavoidable: the motel fridge froze the entries, a traffic mishap ended up in smashed blooms, the dog slept on a prize specimen. I once snatched up the vase of discards, leaving many blue-ribbon candidates behind. And then there’s the time one of my daff friends spent hours filling out her entry cards beforehand…only to forget them. I’d love your input for use in our newsletter–it is reassuring to the novice that even those more experienced can slip up now and then. Nancy, what a fun idea! Can you include the email address you’d like these sent to? Meanwhile, I’ll post mine here and this could result in some fun entertainment on Daffnet if others post their stories here as well. One of the first shows I attended away from home was at Hernando, MS. I forgot all my address labels. 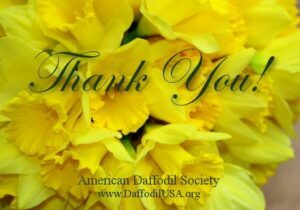 My dear friend Alice who had never been to a daffodil show before nor had experienced the phenomenon of people staging flowers late into the night, was kind enough to sit with me and write my name and address on all my entry cards. That’s friendship! Now I keep a kit ready to take to shows with all the items I’ll need including address labels. Loved your stories, they are exactly what I was looking for. If anyone wants to share an experience but fears Daffnet public shaming, my email is . Thanks again!